In the late forties, I started spending the summer months at an Uncle’s bungalow in West Babylon . 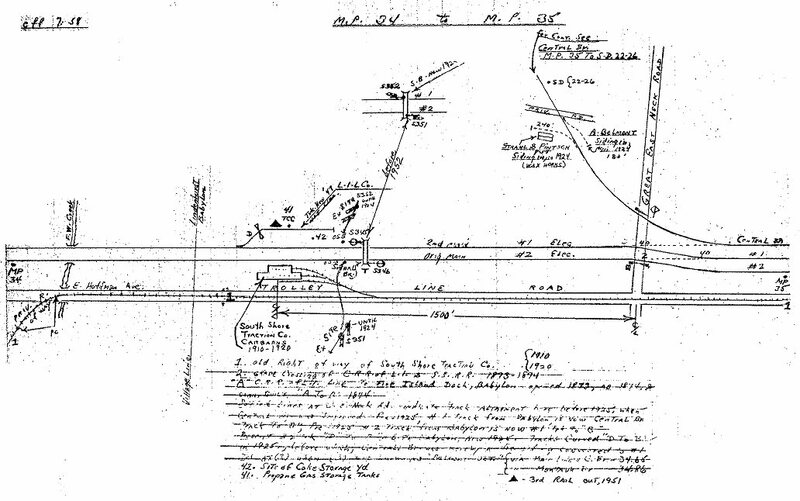 It was located a few blocks-distance from the Great East Neck Road grade crossing on the Montauk (now Babylon) Branch where the Central Branch diverged/converged with the Montauk. In short time, I became acquainted with George Basch (see below) who worked as a crossing watchman Monday thru Friday (in timetable language, Daily ex Sat & Sun) on 2nd trick (3 PM-11PM). George was a bachelor at the time and was an avid railfan – mostly by riding trains throughout the U.S. as well as streetcar lines in different cities. He had a terrible dislike for buses. He tolerated trolley-buses. It wasn’t long before I found myself hanging-out with George at the green and yellow shanty that was his home for eight hours a day. As each train would pass, he would tell me the name of the engineer. He could tell who the engineer was on an approaching steam powered train by the way the whistle was “played.” This could also be done on the MP-54 and MP-70 MU’s, but not as melodious as a steam whistle. However, there was an exception to this by way of an engineer named Andy Post. He could play an air whistle like no other. As was custom, Andy would approach this crossing on his eastbound trip at about 9:15 PM each weekday night. His train would trip the bell circuit in the shanty just after passing the N. Delaware Avenue crossing in Lindenhurst which would alert George to lower the gates. Even before passing the “W,” Andy was on the whistle in an attention getting audio display. And when Andy pulled his westbound trip back to NYP ("Penn Station"), he once again played his symphony. Of course, the headlight was dimmed, brightened and even turned-off momentarily. During the rest of the year, I lived in Jackson Heights. After having been formally introduced to Andy, I would often be invited to ride the cab from Jamaica to Babylon. Even though it was dark, he always scanned the platform (track 7) to be sure there wasn’t any “spies” lurking about that might observe my being admitted into the cab vestibule. 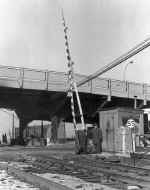 Now, as we later approached the Great East Neck crossing, I had the opportunity to observe the whistle ceremony from the “stage.” George would respond by blinking his flashlight – being careful not to appear to be signaling the train. I would sometimes ride back to Jamaica with the same crew after yarding the train in the Babylon yard – then taking another consist on the westbound trek. When the MP-70 double-deckers became part of the fleet, the eastbound train was made up with ten of those cars – the westbound run was made with twelve MP-54 cars, usually with the first car closed (lights-on), the next four cars open, and the last seven closed (lights-out except that the last car was lighted – first and last cars always had lights-on even it was a deadhead move). Other times, I would get off the train at Babylon and walk back the one mile to the Great East Neck Road crossing and visit with George for an hour, then return to Jamaica with him (“riding on his Pass”) on a Speonk-Jamaica train leaving Babylon at approximately 11:30 PM via the Central Branch. This trip was steam powered until the C-Liners were put into service in 1950. Later, I would be taught how to flag the crossing at South Farmingdale – it was not manned after 11:00 PM. The “bug” was firmly planted in this teenager. The “whistle ceremony,” that I described earlier, almost had dire consequences one night. I mentioned that George would blink his flashlight at the approaching train that Andy was operating; however, he would not start his blinking until he was sure that Andy was the engineer – this being determined by the whistle performance. If it was the normal two longs, a short and a long, George of course would not display the flashlight because it was assumed that an extra-board engineer was running the train. One night, as we were on the way to Babylon (I planned to get off at Babylon and visit with George – and ride with him on his pass back to Jamaica), Andy and his conductor, Roy Swanson, thought it would be a good idea to play a joke on George – just blow the regular crossing signal – then I would walk to the crossing from Babylon – and surprise my buddy. As we passed the crossing, all was quiet, no blinking flashlight – we fooled George – and laughed heartily. As I walked up to the shanty in the dim light of a street lamp, I quickly realized that the shadow that I called out to was NOT George. It was a short man with a heavy Italian accent – and not at all friendly. He informed me that George had marked-off sick, no further conversation – and for good reason. The railroad was very strict about visitors at crossings – a distraction to the crossing watchman. Apparently, this extra man was cognizant of this rule and did not want to test it. So, here I am in West Babylon with fifty-cents in my pocket and my only chance of getting back to Jamaica was about ready to leave Babylon with its twelve cars. In desperation, I explained my situation to my new “friend;” told him that the engineer and conductor are good friends of mine – that they would understand if they were flagged-down. He would have no part of this conversation and told me to get lost. As he was saying this, the westbound train trips the bell circuit in the shanty as it pulls away from Babylon station. Now I am really desperate as to what to do. I walked over to the westbound track and stood below the single bulb street lamp directly across from the watchman’s shanty – which was located south of the Montauk #2 track. I recall that I had a rolled-up newspaper in my back pocket. As Andy started blowing for the crossing, I started waving the paper as I stood under that light – and the headlight of the train started to illuminate me. The more I waved the rolled-up paper, the more creative my friend Andy became with the whistle. The train has by now accelerated to about 45-50 MPH and as the front of the train passes me, Andy realized that I was actually signaling him to stop. In a shower of sparks, the brakes are applied and I start running along the ballast toward the front of the train – which finally stopped. In my excitement, I ran all the way to the first car – never thinking to climb aboard the train at the first step well with an open-trap - further delaying the train. (As a historical comment, the traps were stowed-up and the doors were open running between low platform stations). All I can recall was my shouting up to the cab, “George wasn’t there, he wasn’t there!” When I finally climbed aboard, I never heard so many expletive-deleted phrases coming out of the mouth of my friend Andy and his conductor Roy. After I was “invited” out of the cab, Roy sat me down in the first row of seats (this car was closed-off and Roy had just started into some paperwork when the train came to a halt). I explained the whole sequence of events – had I had enough money for train fare, I could have walked back to Babylon station and ridden a later train – but not on fifty-cents. Roy said that I had better lay-low for a while – at least until they knew if anything had come of this; will the crossing watchman report this, would there be a passenger inquiry or would one of the trainmen report it? After I finished explaining my actions, Roy went into the cab. After ten minutes or so – and a couple of station stops - he came back and said that Andy has calmed down somewhat and wanted to speak to me. Up to that point, I was firmly convinced that I would never again see the inside of a MP-54 or MP-70 cab – kerosene lamps and all. The sixty-five year old engineer was in a different mood now and admitted to me that this whole idea of “fooling” George was really his idea – and Roy was equally guilty. He asked that I become scarce until this little exercise blew-over. And I did. It was about a month later that he called me and said that nothing was ever reported, not any hint of noise being made about the “flag stop.” My hunch is that the crossing watchman kept quiet to avoid criticism for allowing me to actually flag a train on his crossing – and not taking action to prevent it. He seemed to be an excitable fellow, just in our short conversation. I can imagine how much more so when he realized I was seriously flagging-down a train. He probably fainted. The rear-end brakeman was told that it was thought that a deer had been struck – and upon a quick inspection, it was determined that the “deer” was unharmed – as was the equipment. Therefore, the reason for his not being “whistled-out” to protect the rear of the train. Whew! I never heard George make mention of that event – I truly believe he was never told of it. All these exciting things happening at his crossing, while he is home sick. P.S. The photo depicts the crossing in the story. I was waving my folded newspaper just out of the frame (left side) - at night of course. I remember a New Years Eve when I was seventeen. I was out riding with some of my buddies one night on a MU trip. I got on the eastbound train at Little Neck. The crew complement was one trainman short on a six-car MP-54 train - obviously "New Year's Eve" sickness. We departed PW somewhere around 9:00 PM expecting a light load. It had started to sleet, then snow about fifteen minutes before we left PW. I was riding in the cab and, with the engineer, remarked how quickly the snow was starting to accumulate. By the time we got to the Manhasset Viaduct, visibility became so bad that we could not see the road below the viaduct. The conductor quickly realized we were in trouble - just he and the trainman/brakeman working a six-car train with a sudden deluge of passengers materializing beginning at Great Neck. The conductor came to the cab and said, "Joe, I'm putting you to work!" He gave me a set of door keys and positioned me between the fifth and sixth cars - reviewed with me the procedure of the engineer's key position for door-locked position for high level platforms and that the doors would be released to be left open between Little Neck and Douglaston (low platforms). He also reminded me to switch sides at Aurbandale. It was at about this location that the conductor signaled the engineer to run a reduced speed due to the enormous workload of working a six-car train with two people (obviously, I didn't get involved in that phase - just operated the doors). As I recall, the conductor and trainman got caught-up at about Elmhurst and gave the engineer a highball on the communication whistle. The conductor (whom I rode with many times - as well as his engineer, they taught me well on those rides) were pleased with my being able to assist them that cold and slippery night. Yes, the traps trigger many memories with their spring-loaded release and lock-latches. Can't imagine my experiences in those days happening today. It was a Friday night in the summer of 1950. I was visiting with the crossing watchman (George Basch). It was almost time for his shift to come to an end and he was anxiously waiting for his relief to arrive. The man that he was waiting for, drove to his assignment at this crossing and usually arrived at 10:50 PM, ten minutes early. This gave George time to get to Babylon station in time to ride the Speonk-Jamaica steam or diesel powered train that departed at 11:36 PM. He was given a ride on occasion by a local resident - or rode "side-saddle" on the bar of my Columbia bicycle. Fortunate for me, George was rather thin and wiry and the road was flat - it even had a slight downhill stretch by Argyle Lake . On this particular night, his relief - a man named Tony - was a few minutes late and drove up to the area next to the watchman's shanty a little faster than usual - he always parked his car - facing the track (#2). For some reason his vehicle did not slow - he thought his foot slipped off of the brake of his 1937 Chevrolet - and the vehicle hit the rail. In doing this, the vertical bumper guards of the chrome bumper hooked the rail preventing Tony from backing-up. Just as this happened, the ten-car MP-70 train that arrived in Babylon at 10:59 hit the circuit after passing N. Delaware Avenue in Lindenhurst. What stands out most clearly - in my recollecting this event - is Tony's 1937 Chevy spinning its wheels in reverse and going no where, a ten-car double-decker accelerating toward the crossing, my dear friend George in a state of complete panic - and me grabbing a lighted lantern off the hook on the wall of the shanty and running westward down the right-of-way. As I swung the lantern, I was gratified to hear the two "shorts" of the whistle indicating acknowledgment of my signal as the train began braking. In a few short moments, it slowed to a walk, came along side of me and stopped. The engineer (Fred "Freddie" Crabbe) was a little surprised to see me standing there with the lantern - obviously not the crossing watchman, although we had met once or twice. I quickly explained that there was an automobile "hooked" on the outside rail and that the vehicle belonged to a railroad employee. He told me to get on the bottom step and hold on to the grab-iron, he then slowly advanced toward the crossing. In a moment, it was discovered that Tony and George had succeeded in getting the bumper unhooked and clear of the rail. Freddie, who was a big man - square-jawed and all, starting "ragging" on George and as much as accused George of staging the whole thing - because - as he then offered; "Well dammit, since I'm stopped and you need to get to the station, you might as well climb-up here, and be quick about it!" As Freddie lifted the trap and George scrambled up the steps. The engineer gave me a big grin and said "good job kid" as he gave "two" on the whistle and resumed the final mile of his trip to Babylon . He was one of a few L.I.R.R. engineers who wore a white denim cap. As the train cleared the crossing, the thought crossed my mind that I would not be peddling George on the one mile trek to the station - and the "deadhead" move back to W. Babylon was "annulled." I visited with Tony for a few minutes afterwards. He told me that he and George were able to lift the car sufficiently to get the bumper guard to clear the rail - and remove the car from blocking the track. As we talked, he said he noticed me start toward the train with the lantern - and heard the whistle acknowledgment - and suddenly George realized that he needed to get that train stopped (this before they had unhooked the bumper guard). Tony said that my George went right back into panic mode - for the second time in as many minutes - Tony told George that Joe was already doing that. 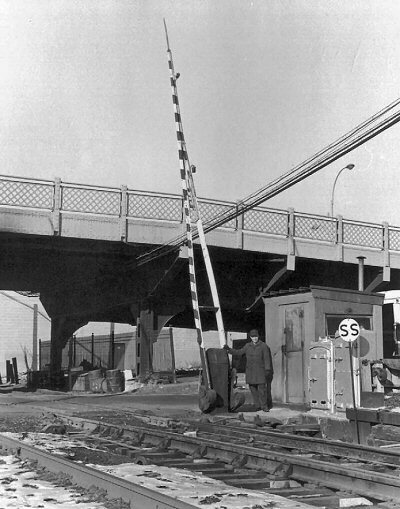 During the same period of time as the "Hooked Rail" incident and the "Whistle Ceremony," another "happening" took place at that same crossing, with the same players - and no one was injured, nor were any trains flagged to a stop. I was once again riding with Andy Post and his conductor Roy Swanson. We had the MP-70 double-deckers - and would return to Jamaica with the MP-54 consist of twelve cars - seven of which would be closed-off. This night I was doing the round-trip with Andy and Roy. At some point, as we proceeded toward Babylon , I mentioned that our friend George was celebrating a birthday - his thirty-ninth. The conversation turned to getting George a birthday card - and perhaps a small gift. Andy (the engineer) suggested that we could accomplish this during the turn around in Babylon . Either I, or one of the brakemen could do this while the train was brought to the yard and the new equipment was brought to the station. The trouble with this idea was that the shops near the station that would sell gift-type merchandise were closed. It was about 9:45 PM. (These were the times when there was no such thing as shopping malls, no K-Mart stores, no Wal*Mart - the term 'big box stores" had not yet been invented). So, I got off the train and purchased a birthday card at a drug store a half block south of the station. Andy suggested that I also attempt to obtain an empty cigar box - I found one somewhere - and of course some gift wrapping paper as well as Scotch Tape. He told me not to worry about a gift, he and the crew would come up with something - I thought that a little strange. While I was doing the errands, the train crew went through the train that they just brought to Babylon and picked up every piece of trash they could find - half-smoked cigars, stepped-on cigarette butts, part of a newspaper, and a small bouquet of almost dead roses. Of course, the empty cigar box became the gift box and the "items" picked up by the crew became the gifts. I must confess that whoever it was that wrapped the box and tied the ribbon did a commendable job - with the birthday card also placed inside the box. The plan was this: as we approached the crossing, Andy would slow to about 20 MPH, Roy would trigger the fireman's-side door to open and I would have the honor to yell "Happy Birthday George" and toss the gift-wrapped box toward him and the shanty which was located adjacent to the #2 track. Also lending festivity to this occasion, Andy provided the music with his "whistle concerto." Yes, the same streetlight that I mentioned in "Whistle Ceremony" illuminated George's face enough for us to see shear delight in our remembering his birthday. As we proceeded toward Jamaica , we all gave our individual version of what George's reaction must have been when he opened his "gift." If any of the old-timers knew George (he retired in 1971), he was lanky, very bow-legged. His most notable feature was a number of missing front teeth (upper) - as well as a quick temper which blended in with his excitable nature. This all came to bear a week or so after our presentation. Our conductor, Roy, was at Jamaica picking up his pay check at the same time that George was - and they met. Roy later related to Andy and me that this was a meeting that he wished had never taken place. George climbed up one side of Roy and down the other and swore that he would never again as much as wave at their passing train - nor would he ever speak to them again. As for me, he made it known that I was no longer a friend of his. I can't recall what the three of us did to smooth him over - but we did and our friendships prevailed over the years. We would all share other interesting events - but never again gift-wrapped. My friend George Basch was really a good man - friendly, generous, very railroad knowledgeable and did his job well - and was quite liked. However, people liked to tease him with practical jokes. At the time the FM C-Liner CPA20-5's were being introduced, a local resident that utilized the Great East neck Road crossing frequently acquired a 1948 Chrysler Town & Country convertible. No, this was not a mini-van. The 1948 version was a two-door convertible with wood side paneling - in the fashion of the station wagons of that era - real wood. The thing that made this T & C different was the air horn that the owner had installed on the left-front fender, a real true-to-life air horn that had it's supply of air provided by a compressor located in the trunk. This horn was a single note "duck horn," same musical note as the horns on the C-Liners. One summer afternoon, George was on duty at his post - sitting inside the shanty. 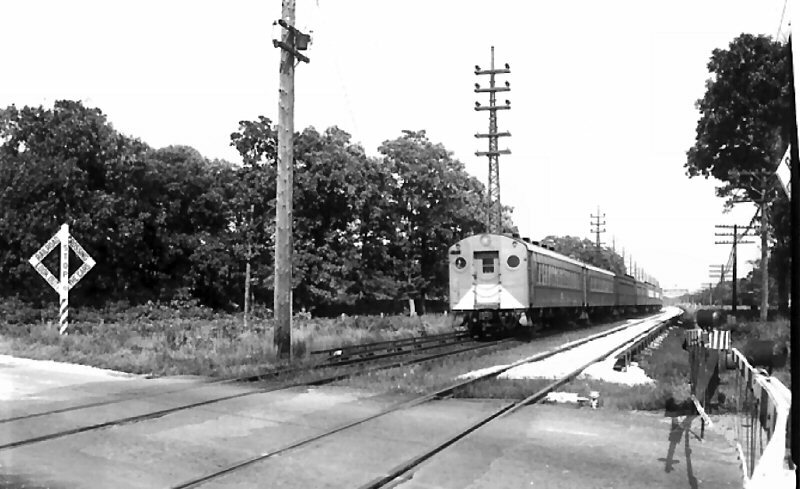 When a train was approaching this crossing, it would trip a circuit approximately a mile from the crossing; on the Montauk eastbound, it would trip the circuit just east of the North/South Delaware Avenue crossing in Lindenhurst; Montauk westbound, the trip occurred as the train crossed Carl Avenue in Babylon - this also applied to westbound Central Branch trains. Trains on the Central Branch approaching Great East Neck Road from the west tripped the circuit in the area of Albin Avenue . So, our friend with the fender-mounted air horn is eastbound on Railroad Avenue - pulls over to the side of the road and lets go with a - - o - blast. George looks up at the light display on the interior wall of his small shanty; all the lights are on, no bell is ringing, yet he heard an air horn blowing the crossing signal. Without hesitation, he leaps up and removes the metal ring from the handles on the gate stanchion, blows his whistle and quickly lowers the gates. Thankfully, in those days, there was very little traffic on that road. The gates are down, a few cars start to queue up north and south of the tracks, and George is looking for this train with a new C-Liner on the head-end. He is becoming more and more embarrassed as each moment passes. Yes, the gates are down, his circuit board is silent, the circuit board lights are all on (the lights would extinguish when the circuit was activated) and there is no train in sight. In the meantime our friend with the Chrysler drives past - quietly. After four or five minutes pass - and the vehicles start to back-up somewhat, George is satisfied that there is no train in his block and, with great caution, raises the gates. When the next "real" train came by, the circuit of course operated normally. As a side note, the circuit board I’ve been referring to was a metal electrical box that had four sets of amber lights – two lights in a vertical position – one set representing each track (Central Branch was bi-directional). When the circuit was activated, the bells inside the box sounded in a steady telephone-like ring, and the two lights representing the track on which the move was taking place would go out. The reason the lights displayed in the ‘on’ position was for fail/safe considerations – a failed light would turn off. If the normal display was in the off position – and the bulb failed – who would know? It took George about a week or so to discover who it was that was blowing for the crossing. Our friend with the “C-Liner” came to a stop at the stop sign on Railroad Avenue which paralleled the tracks. As he pulled away, he let go with a blast on the “duck” and George grabbed his small hand shovel – used to feed his pot-belly stove with coal during cold weather - and commenced to run after the phony wannabe locomotive. He didn’t catch him; however, a L.I.R.R. police officer did catch him a few days later and cited him for disorderly conduct among other charges. He did not do that any more – at least in West Babylon . I am convinced the reason for the grade crossing elimination project at Great East Neck Road was due to incidents that I have described.